If you remember from Wednesday, I mentioned something about J and I having a pretty bad day. It started out innocent enough. We drove to St. Joseph to meet her parents for lunch. When we got there, they were having problems with their Harley, so we had to drive them back to Chicago. We spent about five minutes there and turned around to come back to Kalamazoo. Just as we were passing the Paw Paw exit, I put my foot on the gas pedal and the pedal went to the floor. The accelerator cable snapped. I got off the road safely, but had to call a tow. We took the car to Seelye Ford where they had never seen that happen. Because of that, they didn’t have the part in stock so it would be an extra day before we could get the car back. I got a call from the dealership just before noon that everything was fixed and ready to go. It worked out good because J was just getting off work and since she didn’t have a car, I had to go pick her up. We went to get her car then headed out for lunch. 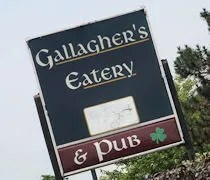 Just down the road from Seelye Ford is Gallagher’s Eatery & Pub. We’re not out in that part of town much, so I thought we should take advantage of being there and check out this Irish pub that boasts a pretty good size beer menu. There are two entrances to get inside. One goes to the Eatery side. The other to the pub. We went to the Eatery, but once we got in there, we found a sign that said the dining room doesn’t open until 5:00, so we headed to the pub. Gallagher’s is designed like the traditional Irish pub. They have some really nice pub tables with chairs that actually have arms and a row of booths that overlook the gorgeous patio. The patio is like an outdoor garden. There are a couple gazebos and a trellis that runs the length of the space…..and it’s huge. The rain had made things a little muggy, so we opted for a booth, but tucked away in the long term memory that there is a really nice outdoor space. A waitress came over with a stack of menus. We grabbed the food menus but there is also a beer menu thicker than those food menus. It’s really quite impressive. They have almost 400 beers available from a wide selection of mirco brews around the country. The Michigan micros are displayed right on front with Bell’s get a little extra special treatment. We both went with Coke’s even though the way this week has gone, we could probably have used a beer. The menu is pretty typical pub food along with some Irish favorites. I flipped right to the burger section and found the Black & Bleu. 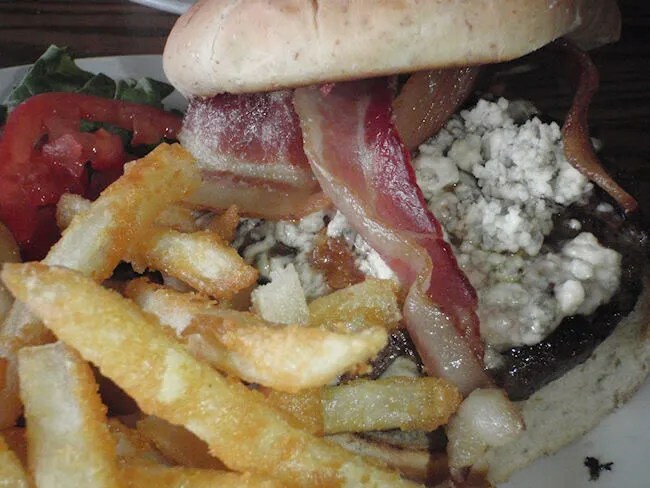 The sandwich is a fresh ground beef blackened patty with bleu cheese, bacon, and onions. It’s served on a slightly toasted bun with beer battered fries. I should probably start ordering my burgers medium-rare. I went with medium and it was still juicy, but definitely cooked through. The patty is press formed so it’s a pretty tight burger. There was a good size mound of bleu cheese and two big pieces of bacon. The bun was just toasted enough that if offered some resistance. Overall, I was very happy with it. The fries were delicious. They were battered and fried very crispy. There was more than I could eat so I shared some of them with J.
J went with the Spinach Berry salad. 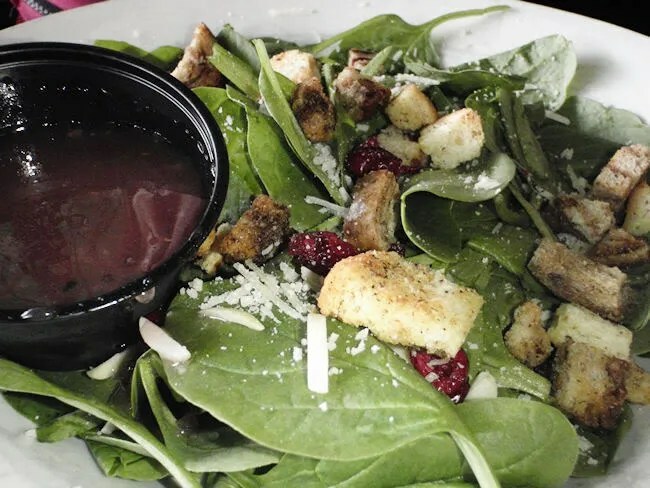 A bed of fresh spinach is topped with Parmesan cheese, sliced roasted almonds, home made croutons, dried cranberries, and a raspberry vinaigrette. She really liked the home made croutons. She couldn’t stop talking about those. She was very happy with the salad and happy to get a fancier salad with spinach. She cleaned her plate, but wished she had a few more of those croutons. Our bill was about $22. It’s a few bucks more than I like to spend on pub food, but we both left full. J’s salad was actually more expensive than my meal, but there are some pretty pricey ingredients in the salad. For some reason, it took the waitress a long time to come pick up our check. Another waitress saw it sitting there and went to get our server. Not really sure what the deal was, but other than that one hiccup, everything went pretty well. Gallagher’s is a place I haven’t really hard much about, but it’s the kind of bar that we could spend a lot of time in. The pub is a really great atmosphere and the outdoor patio looked like it could be a lot of fun in the summer. ← Battle Creek Cereal Fest This Weekend! 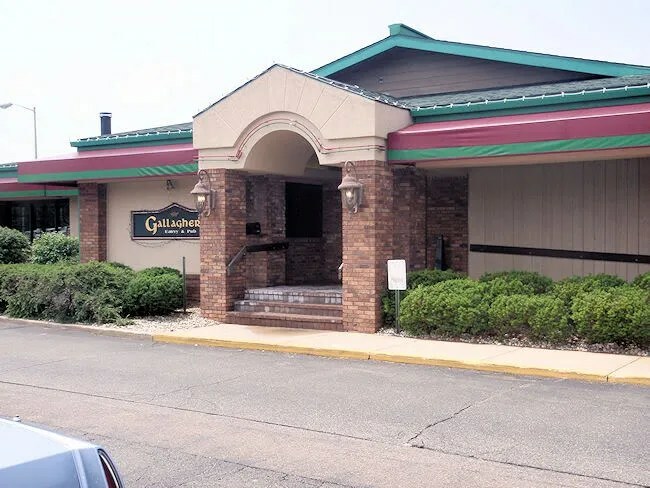 Had a family dinner there – food was not good, price was high, waitress was decent. Gratuity added automatically – still have not figured how that was charged it was about $3.50 too high and they apparently add gratuity on top of the state sales tax. Will not return. never had that problem. How many people were in your party?